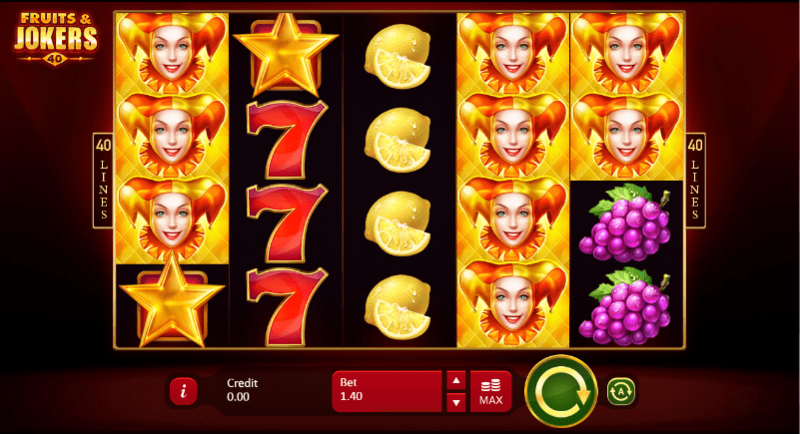 Rarely has an online slot game done exactly what is says on the tin quite as much as Fruits & Jokers: 40 Lines. An online slot largely compromised of fruit and Jokers, it has 40 pay lines and 5 reels, making it the sequel to the original Fruits & Jokers game which had just 20 pay lines. There is a retro feel to this game and it’s the presence of classic fruit machine imagery which helps to create this warming vibe. Find more online slots 3D like this at Wizard. The people behind this slot game are the developers, Playson. A widely recognised name in the slot game world, they are always improving their strong reputation thanks to an always growing list of slot games produced by them. Playson always bring good concepts forward and for the continuation of an already popular title, they keep it simple here and there is a real pleasure to be gained for that. 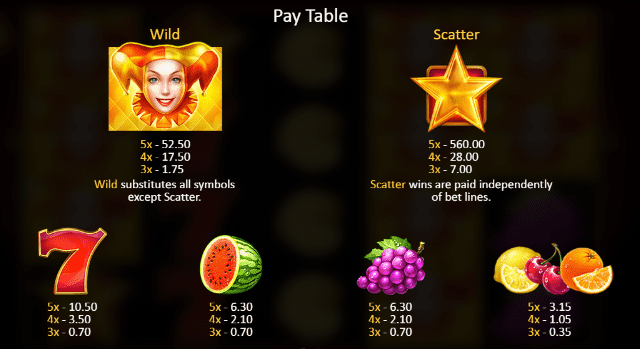 If you are a fan of this slot, maybe check out the original Fruits & Jokers, too. Head to Wizard for and try online video slot games from Playson. As eluded, too, this game is fairly self-explanatory. One the reels, of which there are 5 and 40 pay lines, you will see a load of classic fruit machine symbols. Lemons, cherries and oranges are the lowest paying of the edible symbols, offering a minor 0.75 times your stake for 3 on a pay line and a more respectable 2.25 times your stake for 5 of them. It's because of its simplicity that this is known to be among the best video slots to play. Better than these symbols are the grapes and melon, more important fruit in this proverbial fruit bowl. Should you land 3 of these on a pay line, you can expect a payout of 0.5 times your stake, with 4 of them getting 1.5 times your bet and finally, 5 in a row landing you a useful 4.5 times your stake. Whilst these don’t sound like a lot, especially compared to some heavy multiplying prizes to be found elsewhere, the 40 pay lines ensure that you win here more often than most. The bets of the standard symbols is the familiar Lucky 7, a classic symbol from fruit machines of old - back in the days when service stations and pubs were the only places to spin a slot. Landing 5 of these 7s will get you a great 7.5 times your stake, meaning that the best wins come from special symbols. The female jester is the wild in this game and as such, can be swapped in and out for others to create winning combos. Land 3, 4 or 5 of these wilds on 1 of the 40 pay lines on offer, and you will get a reward 1.25, 12.5 or 37.5 times your stake, respectively. The golden star is the scatter and this doesn’t trigger any bonus features in this fairly simple game, but can land the biggest of all the prizes with a huge 400 times your stake being the prize for filling a pay line with them. If you like your slot games to have a classic feel, this is the slot game for you. Fruit and Jokers are both classic imagery from the fruit machines of old and provide a dose of nostalgia as well as a chance to land a nice jackpot. The retro vibe is a popular one and therefore, so is this online slot. If you liked this, why not try Reel Talent and try your luck!